The MO was a class of small ships produced before and during World War II for the Soviet Navy. Their primary function of Small Sea Hunters originally was anti-submarine warfare. During the war they carried out many additional roles from supporting landing operations to escorting convoys. One MO-1 (1935), 27 MO-2 (1935-1936), 4 MO-3, 219 MO-4 (1937-1943), 46 MO-D3, 140 OD-200 (1943-1947), 66 BMO (1943-1945) ships were built. MO ships had no armor and had a wooden structure, but consisted of nine sections isolated from each other, allowed to stay afloat even after suffering heavy damage. MO-D-3 was the version of the TKD-3 MTB. OD-200 was made of wood and partially armored by 7 mm plates. BMO was made of steel, with armor of up to 12 mm. Soviet Navy warboat MO-2 photo WW2. Soviet armoured sea hunter BMO of project 194. WWII photo. (note: most of the MO-4 units in Black Sea were named “SKA”, patrol boats). During the evacuation of Sevastopol, the patrols SKA-0112 and SKA-0124, full of soldiers, were attacked by the German motor torpedo boats S-28, S-40 S-42 and S-102. A fierce battle erupted, and both the soviet units were sunk: 37 sailors and soldiers were captured by Germans including a general. Germans paid a price for their success, because while S-28 had one killed, the S-40 was heavily damaged by direct hit and suffered 3 killed and 10 wounded. S-40 was forced to 11 months of repair. Soviet patrol boat SKA-0175 together with the motor torpedo boat TK-154, attacked and sunk the German schooner n°2412. 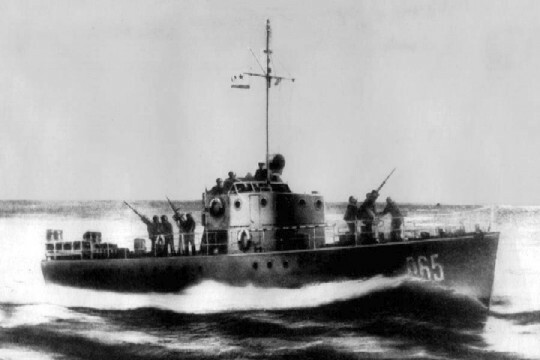 Soviet patrol boats SKA-031, SKA-0141 and SKA-0512, helped by a seaplane Chye-2, scored the best success with depth charges in Black Sea: they damaged the German submarine U-18 that was then forced to return at the base (repairs however will last only until the end of January 1944). Into Ladoga Lake, MO-206, MO-213 and MO-215 (all of MO-4 class) ambushed and captured close Vekkosaari the Finnish motorboat E-32. There were 2 POW. The most famous fight of MO-4 class: a group of Finnish patrol boats (VMV-8, VMV-9, VMV-10, VMV-11, VMV-17) attacked with their superior number MO-207 and MO-303. Despite being outnumbered, the Soviets managed to break the attack, even if on MO-207 the commander was killed and 3 sailors wounded. Finnish suffered damage on their flag-ship VMV-17, suffering 1 killed and 1 wounded. 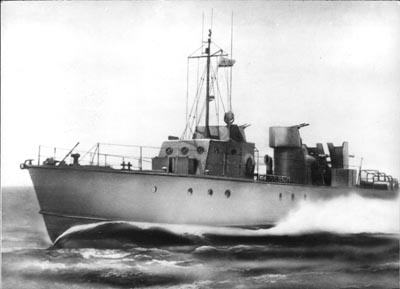 Old soviet sources wrongly claimed the sinking of Finnish motor torpedo boat Raju. Finnish sources wrongly claim the sinking of 2 Soviet patrol boats. MO-122, MO-202, MO-213, MO-401 and MO-413 (all MO-4) fought against the German motor torpedo boats S-76, S-79, S-91, S-132, S-135. 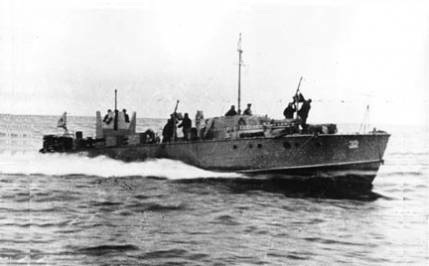 During the battle MO-122 was sunk with 9 killed. Germans had 2 wounded on S-91. MO-104, MO-302 and MO-313 (all MO-4) engaged S-91, S-97, S-114, S-135. Commander of MO-302 was killed alongside 2 sailors (other 11 were wounded) when the unit was damaged, however the Germans suffered a direct hit on S-97 and heavy damages (with 3 killed and 1 wounded) and 1 wounded on S-114. 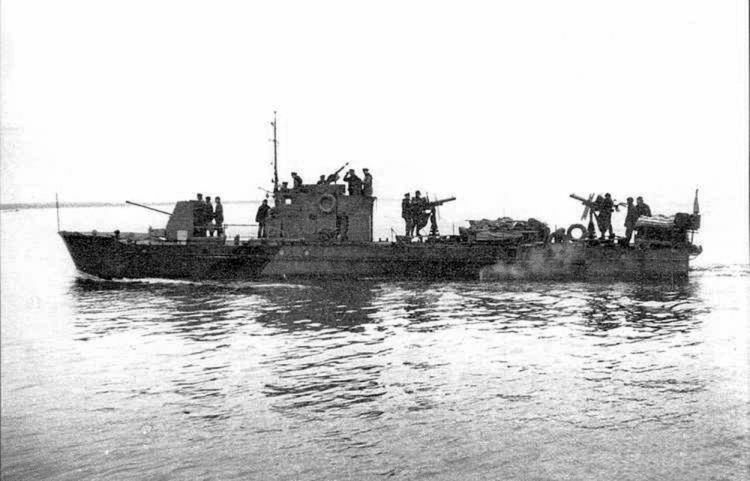 15 July 1944 MO-104 and MO-105 (of MO-4 class) fought with motor torpedo boats TK-47 and TK-57 against the German submarine U-679. During the surface battle, a torpedo missed the submarine but it was hit by gunfire, suffering 8 wounded and retreating. The best success of MO-4 class. MO-103 attacked with depth charges and sunk the German submarine U-250. The Submarine was sunk in low waters: commander and other 5 sailors were captured. The wreck was easy to recover and despite multiple German-Finnish attempts, Soviets accomplished it. On the wreck of U-250 was captured an Enigma machine and the new German acoustic torpedoes (Zaunkonig). It was the last battle of the war. MO-121, MO-122, MO-131, MO-204 (MO-4 class) together the n°175, n°176, n°177, n°183, n°192 (former motor torpedo boats of D-3 class), and other smaller boats, intercepted a convoy of ships that carried escaping Latvian collaborationists. The enemy armed tug Strelnieks was sunk in battle. The armed tug Rota surrendered and was captured alongside the barge n°833. A second barge and two schooners were scuttled by Soviets. 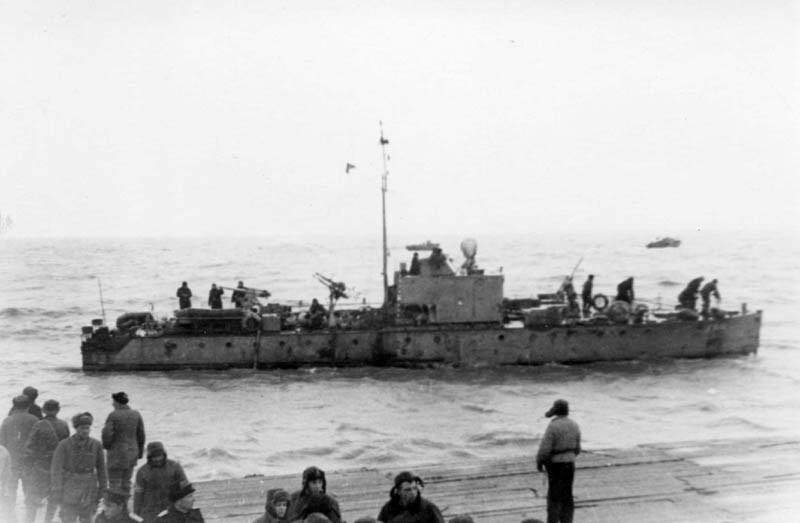 One tug (named Una) managed to escape with 100 passengers (670 were captured, alongside an unknown number of killed during the sinking of Strelnieks). MO-4 class units were never employed to fight enemy vessels. They were less numerous, compared with the other Fleets, however were actively used for mine-laying purposes. With these mine-laying operations, MO-4 class units scored some successes . 16/03/42 German merchant Utlandshorn (2643 GRT) was sunk. 19/11/42 German auxiliary torpedo boat Schiff-18 Alteland (MN-01) was sunk. She was armed with 1 88mm gun and 2 torpedo launchers. 30/11/42 German merchant Westsee (5911 GRT) was sunk with a cargo of hay and straw. 30/11/42 German merchant Hans Rickmers (5226 GRT) was heavily damaged by mine and then finished and by Soviet coastal artillery, with a cargo of hay and straw. 1/02/43 German patrol ship V-5909 Coronel was sunk. 14/04/43 Norwegian tug Pasvik (238 GRT) was sunk. 21/09/43 German merchant Antje Fritzen (4330 GRT) sunk with cargo: 742tons of hay, 361tons of food, 2019tons of cement, 100tons of ammunition, 170tons of booths. 12/12/43 German patrol ship V-6016 was sunk. 25/01/44 German tanker Mil (244 GRT). Both MO-121 (later renamed MO-113) and MO-163 (later renamed MO-131) gained 3 shared victories each. There was one surface-action victory: on 15 April 1943, MO-123 and MO-133 shelled and destroyed the motorboat Shchuka (46 GRT) on German shore. Ship defected earlier, Germans unloaded the cargo (food) but could not bring her to safety in time. 10 August 1945 Japanese merchant Riuko Maru n°2 (2230 GRT) was captured by a group of Border Guard patrol boats near the mouth of river Vorovskaya. 405 POW were taken.